If you already have Alexa, you’re probably using it for playing music, setting alarms, checking the weather or asking random questions. But did you know that there are Alexa skills that can boost your company’s productivity? Let’s start! Astrobot helps you manage your Gmail or Office 365 email by telling you how many new priority emails you have and helps you read, reply to and manage your inbox. If you’re in a hurry, you can ask Alexa to categorize your emails into Priority Inbox, which includes emails from people you interact with. When you ask Alexa to read only emails from Priority Inbox, you avoid spending time listening to newsletters and promotional mails. If you’re in a hurry, but you want to reply to some email later during the day, you can just say Snooze or Star. Also, if you don’t want to get back to some email, you can say Delete or Archive. 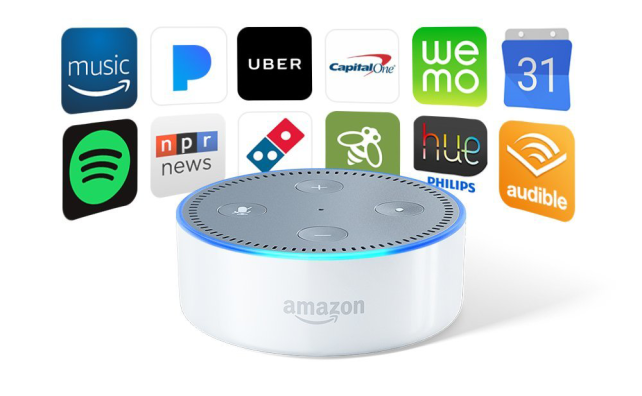 Voice Metrics connects your data and apps with Alexa to make your information available by voice, anywhere and anytime. You’re interested about your business results for today? Just ask. Voice Metrics takes real-time data briefing and customizes it to whatever business data you want to know about today. The skill can be integrated with Google Sheets, Slack, or any other data source. If you want to know more about sales, orders, customers, inventory status or department updates – just ask. Convenient, you must agree. Vonage built the Conference Manager, an Alexa skill that syncs with Google Calendar to identify your next conference call and save you the hassle of dialing it. Conference Manager scans your calendar, dials the conference number, enters your meeting or participant code, and then calls you through your Alexa-enabled device. All you have to do is say: “Start my call”. QuickEvents allows Alexa to add events to your primary Google Calendar. It checks for conflicting events, and asks for confirmation before adding your event. When scheduling events, you can provide relative dates, such as “tomorrow” or “next thursday”, or you can provide a specific date. If you don’t specify the length of event (“at 9:00 p.m. for three hours” or “from 8:30 a.m. until 11:00 a.m.”), events will be scheduled for 50 minutes. QuickEvents can also support multi-day events or all day events. QuickEvents will save you the trouble of checking and organizing your Google Calendar daily. You know you need this in your life. Do you use Wunderlist to manage your tasks? Than you’d want to have a Task Master skill for Alexa! Quickly review your task lists, find out what is due and add tasks. Wouldn’t it be nice to just ask: “Alexa, ask Task Master what is due today” and get the answers instantly? Another app that doesn’t have an official Alexa Skill, but with Edit Docs you can add brief ideas to a Google document. It also has the ability to list your last ten used files and create a file. Edit Docs needs to sync with your Gmail account and Google Drive. Do not let all those bright ideas go to waste, just tell them to Alexa and you will have them on your Google Drive forever! -See your phone’s notifications, text messages, and phone calls on your personal computer and more. Due to high demand, the skill is currently in closed beta. When you enable the skill, you will be added to a waitlist. Worth waiting for, we’re sure! If you work in marketing or in recruitment, you will love this skill! If there’s anything that you want to tell your Linkedin contacts, but you have your hands full with something else, just ask Alexa to do it for you. With CheckedIn, you can ask Alexa to update your feed with new insight, status change or a quote. Visiting your website analytics page repeatedly to see how many visitors your website or blog is getting? This Alexa skill is your solution! Web Analytics uses information from Google Analytics to tell your website’s visitor traffic information. You can ask Alexa to give you real-time website visitor traffic as often as you need it. Expense tracking is paramount for every business, and the Expense Tracker skill creates a financial overview and manage expenses. At this point, it’s more personal than business-focused – for example, you can track expenses for clothes, food, fun, household and work. If you want to track something specific, you can easily create a new category. Do you have a business that deals with the logistics of drivers, deliveries and shipment tracking? Rhino Fleet Tracking skill will save you a lot of time! You can ask Alexa for the locations of your vehicles or drivers. You can also use this skill to assign drivers to vehicles and to search for drivers that are on specific locations. -A breakdown of your store visitors. If you’re watching Suits, then you know that Louis Litt would use this Alexa skill a lot! Daily Log is a dictation assistant that allows you to dictate one sentence at a time, and saves all those sentences in a single log entry. If you want to create notes, journal entries or just quickly capture ideas, then you should get this skill. Speak each sentence or phrase, then pause for a breath while Alexa “writes it down”. When she’s done, you’ll hear a subtle “beep”, meaning that you can now continue. Do you use hourly rates to bill your clients? Or maybe you’re tracking time to increase the productivity of your processes? Use the Work Time Tracker skill to track your time by asking the skill to start tracking your work and to stop when you are done. If you want to know how much time you spent working on a project, just ask Alexa for the sum of all tracked work units. As a business owner, you never know when you might need an electrician, a plumber or any other service. With Intently.co skill, you can have access to more than 1 million service providers. Just ask Alexa for a handyman, and it will connect you with qualified service providers in your location within minutes. And lastly, the best way to increase productivity with Alexa is to search for Alexa’s newest and top skills. When you enable the Skill Finder, Alexa will tell you about the new Skill of the Day. Other than that, you can ask about the newest skills and the top skills in Alexa catalog.